I'm extremely impressed with usfunks.net. Truly WOW!!! I love the extensive history, sources, and photos. Robert James Funk was my father who married Leota Marie Jones. They had 15 children. I think he looked alot like Harold. . 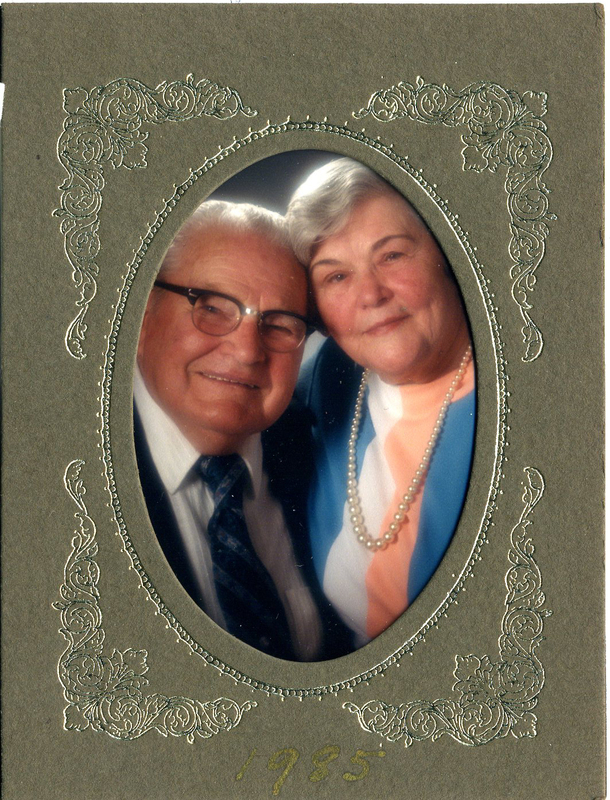 I thought you might enjoy a couple photos that I recently aquired of Robert K and Gertrude (Old) Funk; as young, older, and with their son Robert James' family in 1967 with 12 children---2 more were born after that and a previous child, Bernadette, died when born prematurely in 1955. Also a couple photos with Harold. My mother's family is harder to trace====native American- Assinboine-Sioux- Crow intermarried with white settlers, immigrants. I now have a partial pedigree chart prepared for someone on her father's side, a testimony signed by thumbprint of her g-g grandparents (they didn't speak English), and some photos that I never realized were hiding out there in family stuff. I felt I'd hit a gold mine even though it's not much and doesn't go back far; it's allowed me to find out more. Again, I want you to know how much I appreciate your work on the website. If I had found it sooner, along with my gradndfather's stuff, that would've saved ALOT of work. My geneology stuff isn't nearly as sophisticated or as complete as yours....still alot of unanswered questions. I just gathered information and took off running, Then I gathered more information without citing sources which largely consisted of familysearch.org and findagrave.com I have RootsMagic software which I haven't figured out an easy way to go back and cite sources. What did you use? Sorry that this is so long Hope you enjoy the photos attached. Let me know how you fall in line with Harold??? In looking for some information on my mother’s side of the family, I randomly decided to type in Grant Funk, my father, to see if there was anything out there. I found your website. Nothing really seemed to connect, but thought I’d give you the little bit of information I have and see what my come of it. I really don’t know a lot about them. As a little girl, I remember attending Funk family reunions in Aliquippa, PA. in the Pittsburgh area. The family I knew of were in the Erwin, Aliquippa, Pittsburgh areas. 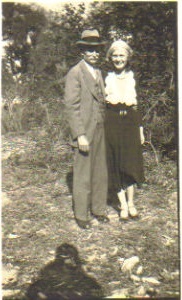 My great grandparents names were Grant and Flora Funk. 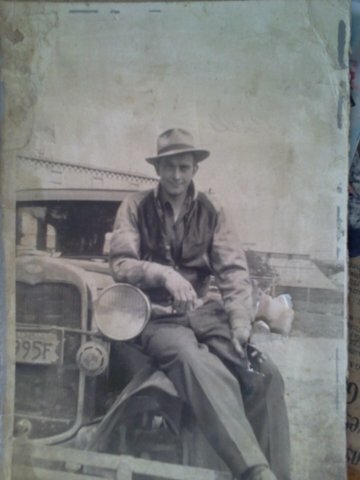 One of their sons, my grandfather, was William Edgar Funk. He had two legal sons, Grant William and Raymond Edgar Funk. Both of them had 4 children each. My grandfather and uncle were horrible fathers and have children all over the place. Uncle Ray had so many wives with only one of them being legal. At one time, he was on the FBI most wanted list as I have heard. I remember him but didn’t like him at all. I don’t know if that is of any help with genealogy. I do have a few pictures I will send you. Thanks for all your hard work!!! hello Jay I found your site on the Funck family .I am down line from Martin and Judith, I have visited their grave sites in Ebenezer,a very surreal feeling.my dad was Bruce Funck he passed away 1996,was trying to get back as far as I got before the cancer took him home.Jay I did find Jacobs father, Hitz Funck m.Barbara Grubb ( but the last name was spelled differenty on other sites,but I was happy to find that one. I m writing from Campbelltown, Lebanon county Pa.
Thans for you posting your site .I did my DNA,was looking up more information. Here is a picture of Silas Funk (Civil War Photo) and Jesse Funk with his daughter (my grandmother) Yuona Sue Funk. Thought you might want to add one or both to your website. could we possibly exchange information? My Funk Family Arizona Connection as of March 9, 1957. Father: Albert Arthur Funk Mother Edith Elnora Cutchall, preferred "Elnora" All moved FROM Michigan to Phoenix, Arizona. Where can I view THIS STATE website for them? Thanks.. again sons Lewis and Bruce are deceased, parents are deceased, unknown whereabouts for daughter Marlene Funk Lobdell and son Merle Funk. WOW didn't know this existed. How simply fantastic! I married Bruce Norman Funk in March on the 9th, 1957 here in Phoenix, Arizona and of course his father was Albert Arthur Funk and wife Edith Elnora (Cutchall) Funk. She preferred and used Elnora. The family consisted of Bruce, brother Louis, brother Merle and sister Marlene. Bruce and I were married until January 1971. 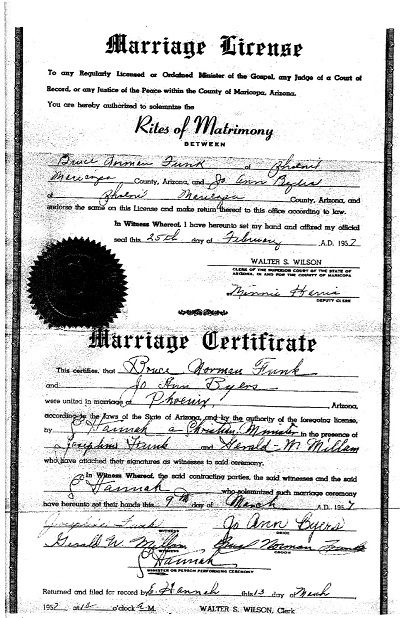 In April 1971 he married Mildred Ann Jackson (nee: Simpson) I am now 76 and have married both a second and third time and this marriage is from February 16, 1980. Bruce died of complications due to Cancer. Mickey his widow and are still good friends. 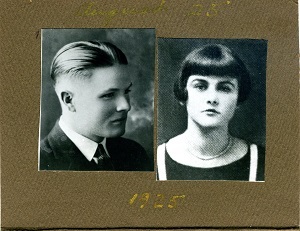 Lewis married Josephine and they had a son Terry and daughter Debbie. Josephine, after his death remarried and I believe she lives in Utah. Terry is a truck driver and Debbie and her second husband live in Queen Creek. I had been in touch with Ms. Pauley who lives south of me and she sent me some family Genealogy and so I have bits and pieces., Bruce and I did have a son and a daughter but they were adopted by my second husband Kenneth Allen Hiebert. Ken died of Cancer 22 February 2002. My maiden name was Jo Ann Byers. If we can connect would be great. I have tried to do my own Tree but there is a woman who says she works for LDS and so my Tree is constantly being deleted and changed so almost afraid to continue. She told me she can get into anyone's tree and I tried the private setting but she still gets into it so my Tree is just not accurate anymore. My legal name is January. my email is januarystar@cox.net. sending now Sat. 6-7-2014. I still live in Arizona but mom and dad Funk both died (they had Cancer also) in California I believe. Have no idea where Merle might be but I do know he had about five children with his wife Arlene and they long ago divorced. I think Marlene and husband Dave Lobdell moved out of California and are living elsewhere. Not being with the survivors of the Funk Family here in Arizona I have sketchy information. I just want to say hello. I stumbled across your web site this afternoon and appreciate your collecting and sharing all the information. I am a descendent of Catherine Funk (daughter of Jacob) and her first husband, Henry Harding. 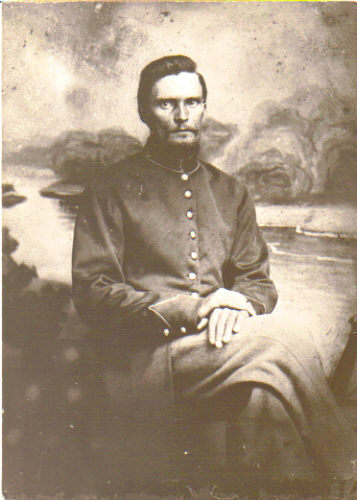 Catherine's son Jacob was my great-great-grandfather. As you note, Catherine and her second husband, Samuel McGee, moved to Edgar County, IL, in about 1825. I'm not sure whether Catherine's son, George Harding, moved with them or followed. In any case George was a farmer, as were several of his sons. Jacob Harding served an apprenticeship with a newspaper printer in Corydon, IN, then moved to Knoxville. There he read the law with a local attorney and politician, John Robinson Nelson, married the bosses daughter (Love Forrester Nelson), and with Nelson started a couple of unsuccessful newspapers. In the mid 1830's Jacob and family moved to Edgar County, setting up shop in the county seat, Paris, and raising a large family. In the late 1840's, after the first couple of sons had done apprenticeships with newspapers in nearby counties, they started another newspaper, which survives today. All the Hardings mentioned in 1879's "The History of Edgar County, Illinois" are related. Hi, I found your web page and was SO amazed to see all the work you have done! I was so happy to find it! I was just searching around for some other line and the page popped up. My name is Meg, my mother is Susan DeCamp, the oldest of Paul W. DeCamp Sr. Paul W. DeCamp Sr. was the son of Earl Wayne DeCamp and Addie Lindley. Earl was the son of Philip DeCamp and Isabel Funk; daughter of Harbin Funk and Martha Applegate. I would love to give you some input on the family as of today as you only have Earl DeCamp and an Addie Unknown and a list of their children. Isabel Funk is my great-great grandmother then. Let me know if you would like an info update for your tree. 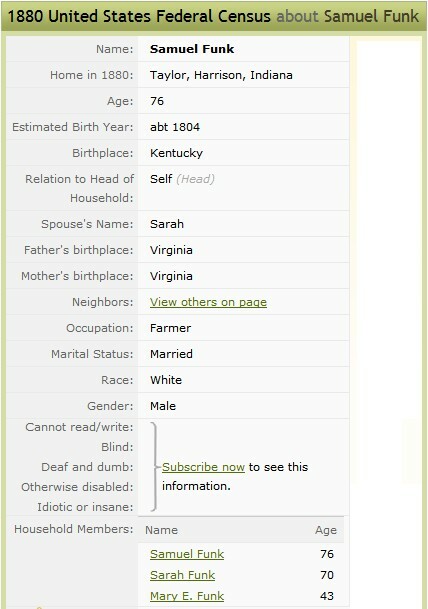 I am also on ancestry.com if you are interested. memcgath is my screename. Hi Jay, You have done a remarkable job on your family web page. My Funk line is through William Funk, son of Jacob and Williams second wife, Elizabeth Summers. My questions is who is the father of Elizabeth. The marriage records report Elizabeth as the daughter of Michael. It is only an abstract done by Beanblossom and I haven’t seen the original to know if there is an error. What is your source for saying John Summers is the father? I have a hunch if Michael is the father, he is a brother to John, but I have little to do on. My line is additionally through William’s son Silas and his son Alva. Have you found a will for William Funk and also John or Michael Summers? I would be happy to give you my info on my line if you are branching out that far. I am writing concerning Jacob Funk who was born 1771 and died in 2 March 1849 and his wife, Julia Ann Heidrick born in 1779 and died 9 Oct 1856. They were married in Shanendoah County, VA on 21 August 1802. Their grave is located in Pike County, Ohio in a small family cemetery with their son Nicholas and several of his family. Jacob and Julianna were the parents of six sons and four daughters. 1. Mary lived from 17 May 1801 until 21 April 1883. She married Hezekiah Franklin. 2. Catherine was born in 1802. She married Simeon Franklin. 3. Samuel lived from about 1806 until 1857 or 1858. He married Nancy Hardgrove. 4. Elizabeth was born 1 Jan 1808 and died 11 Aug 1894. She married James Bunting. 5. Susan lived from 2 April 1813 until 14 Oct 1895. She married James Snyder. 6. Michael was born about 1814. He married Margaret Mossbarger and is said to have moved west after 1860. 7. John was born 5 May 1816 and died 11 Dec 1905. He married Lydia Lucretia Lull. 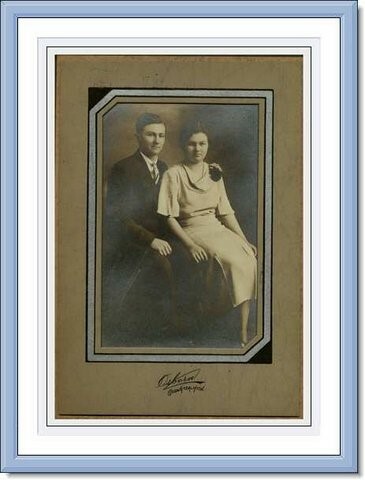 (They lived their whole lived in Muskingum County, Ohio and are my second great grandparents). 8. Isaac lived from 18 Aug 1819 until 22 Oct 1886. He married Maria Louisa Stotts. 9. Nicholas was born 31 Jan 1824 and died 9 May 1886. He married Lydia Gall and after she died he married Mary Graham. 10. Philip was born about 1828. He was living in Pike County, Ohio in 1850 and is thought to have died quite young. He married Mary Ann Mosser. I have visited most of these people's graves. I had thought that Jacob's father's name was Michael Funk and Julia Ann's father's name was Christian Heidrick. 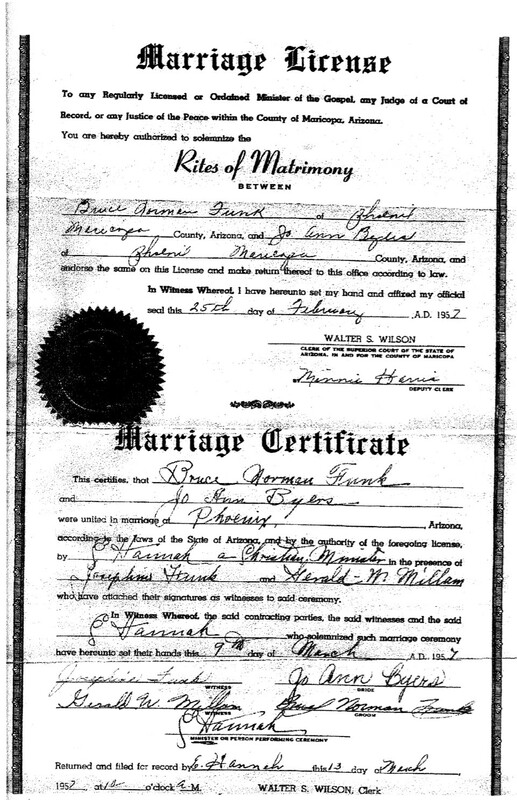 I believe this information was found on a Shanendoah County, Va marriage license.